Ethniki Insurance was founded at a time that could be considered as not favouring such a visionary business initiative. All attempts for the establishment of Greek insurance companies up to that point had failed and the public’s trust in these initiatives was shaken. The turn to foreign insurance companies was indicative of that period. The need to establish a major Greek insurance company was there, but the environment in which such a company would have to grow was adverse. In spite of that, Ethniki Insurance was founded and came face to face with these conditions, disproving the status quo of that period. The National Bank of Greece was the first to become aware of the lack of a trustworthy Greek insurance company and, thus, took the initiative to establish it. Pavlos Kalligas, the NBG CEO, stated, among others, at the Shareholders’ General Meeting for the accounting year of 1891 that, working together with other credit institutions in the country, a Greek insurance company must be founded that would serve the public interest and dissuade the export of foreign currency that insurance policies with foreign insurance companies entailed. The aim was to establish a company that would comply right from the outset with high-level specifications and would be based on solid foundation. Thus, five top Greek banking institutions, NBG, the Bank of Constantinople, the Bank of Epirus and Thessaly, the General Credit Bank of Greece and the Industrial Credit Bank of Greece founded Ethniki Insurance in 1891. The leading figures of this effort, Pavlos Kalligas and Stefanos Streit, took it upon themselves to find partners that would be in a position, with their know-how and experience, to realize the founders’ vision. For this reason, they turned to major banking players both in Greece and abroad, particularly among the Greek diaspora. Indicatively, the private individuals that had an equity stake in the new company were some of the most important financial stakeholders of the country, whereas there was strong response from the Greek diaspora as well. The share capital was GRD 8,000,000, an exceptionally high amount for that period. The people that staffed the company were renowned personalities. It is worth noting that the role of the CEO was offered to Enrico Pontremoli, an insurance expert of the time, who, through the organizational basis it established, ensured that the new company could boast optimal structure, proper organization, international connections and high quality of the services provided. Furthermore, Stefanos Streit, one of the leading figures of this effort, was appointed the first President of the Board. As of its foundation, Ethniki Insurance was active in all insurance areas, undertaking all types of insurance and reinsurance both in Greece and abroad, whereas it was the first company in the Greek territory that introduced Life insurance. Unfortunately, a few years later, the company had to discontinue Life insurance operations for approximately 50 years, since the conditions for the development of life insurance policies in Greece were not mature at the time. It is worth noting that one of the clients of Life insurance, at the time, was Eleftherios Venizelos. The founders’ main concern was the development of a network that would not only cover the Greek territory but foreign territories as well in the sectors of Maritime and Fire insurance. Within a short period, Ethniki Insurance boasted a significant presence in almost all Mediterranean cities that were important commercial hubs. Its network focused on the commercial ports, islands and major cities of the Greek state at the time. In the cities where no general agency was established, Ethniki Insurance cooperated with NBG, with NBG’s branch managers serving as the company’s insurance agents. Abroad, with the general agency and other agency networks it established, the company aimed to make its presence known in the Greek cities that thrived outside the borders of the Greek state as well as in foreign cities the combined a noteworthy Greek diaspora with increased commercial traffic, from Constantinople and Marseilles to Port Said and New York. Its growth, immediately upon foundation, can be characterized as impressive. Within a relatively short period, the newly-founded company expanded in Greece, Europe as well as South and North America, not only in the insurance field but in the reinsurance field as well. 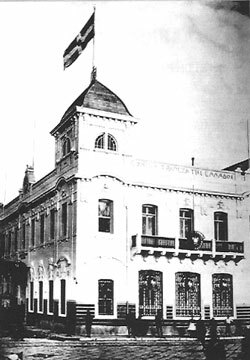 The first hardship came in 1896 when the South-American city of Quayaquil, Ecuador, on which Ethniki Insurance had concluded a reinsurance policy with an English company, was burnt to the ground (a damage amounting to millions of British pounds). 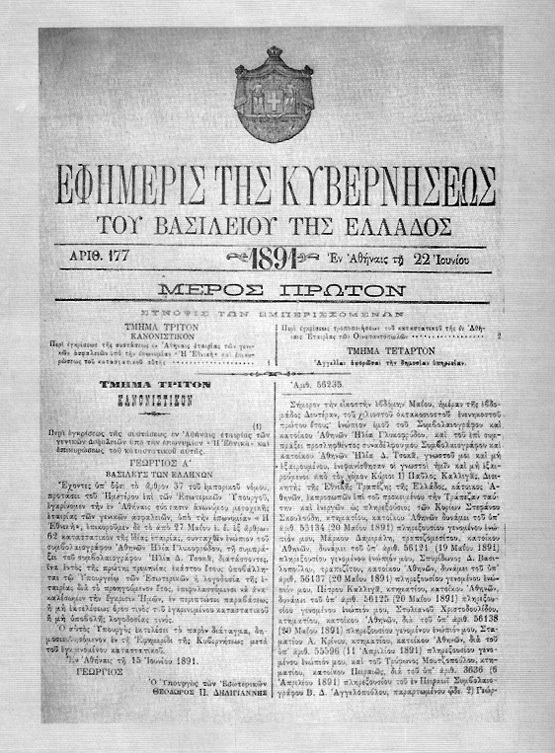 In 1897, the state of the economy due to the war and the political unrest in Greece and internationally did not leave Ethniki Insurance unscathed, with the company being forced to make important decisions on its future course. As such, based on the resolutions of a series of extraordinary Shareholders’ General Meetings, the company decided to reduce its share capital considerably and discontinue operations abroad, with the exception of Turkey and Egypt, in the areas of Fire and Maritime insurance. In 1899, the company reduced its share capital for the second time. As of 1907, Ethniki Insurance ceases operations in the area of Maritime insurance that proved detrimental because of the prevailing general conditions and, as such, it was active for a large period in Fire insurance. Ethniki Insurance experienced all of the nation’s wars from 1897 to the Second World War. Events that shocked Greece, destroyed businesses and tore the Greek economy apart had an impact on the Company, which, however, managed to adjust and support, with every means available, the nation’s struggles, at incalculable cost. This is because the Greek economy’s gain, the response to national disasters, the communication between the Greek communities around the world, the development of the insurance institution and the satisfaction of Greek insurance needs were and still are what counts as profit for Ethniki Insurance. 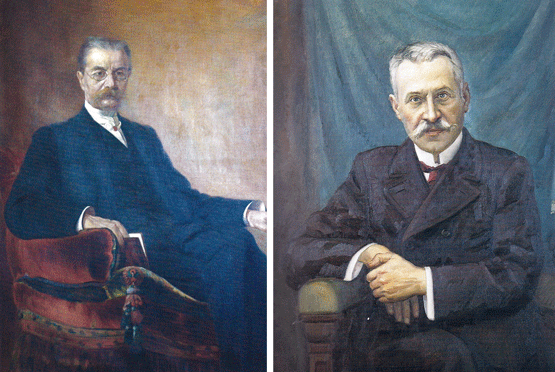 The Balkan Wars of 1912-1913 resulted, naturally, in fewer insurance operations; however, the end result was positive. After the liberation of new areas, the company rushed there, opening new agencies or reinforcing the existing ones. The share capital remained stable and the company’s real property increased rapidly. At the time, as part of the establishment of agricultural cooperatives being encouraged by the Greek Government, Ethniki Insurance provided insurances not only for the farmers but for the products stored in their warehouses as well. The extent of operations in that field was the cause of a great number of problems due to frequent fire losses. In 1910, the first two laws on insurance companies were enacted in Greece and, a few years later, in 1917, Law 1023 on ‘private insurance companies’ was introduced, which essentially served as the basis for the entire insurance legislation that followed. The author of said statute was the well known Law School Professor of Athens University and member of Ethniki Insurance Board, Mr. Alkiviadis Krassas. The First World War gave rise to a great number of problems for the Insurance Agencies that were located in territories held by the Ottoman Empire. The Turkish Government imposed, by virtue of law, the payment of huge cash guarantees by foreign insurance companies, so the company decided to suspend temporarily its operations in Turkey. This led to a decision to expand its network in the Balkan Peninsula. In the 1920s, the company adopted a conservative approach in all areas, which, combined with its growth objectives, allowed it to develop in the long-run. Previous experience made the company more proactive and able to prepare for any contingency. The instability and uncertainty of the 20s resulted in a gradual effort, on Ethniki Insurance’s part, on the one hand, to set up gold reserves and, on the other hand, to invest in real estate markets or construction projects for real estate renovation and refurbishment. In the 30s, the Company continued to operate in the field of Fire insurance as well as work together with NBG and the National Mortgage Bank of Greece. The generally adverse financial situation did not allow the company to engage in other fields, although it did contemplate the re-establishment of Life insurance. Although the 30s did not favour big profit, the Company’s annual revenue was considerable due to the prudent management applied at the time. Contribution to society was exceptional, the company’s staff was properly remunerated and, most of all, the company provided compensation in the best possible way with regard to the risks assumed. Indicatively, it is worth noting that, in the 30s, 88 agencies operated throughout the country, not including Athens and Piraeus, covering large towns. The agencies’ operations (policies, claims, commissions, profits, costs) were diligently monitored and audited. Head office executives constantly conducted on-the-spot inspections and paid frequent visits to the agencies whenever an issue came up. What stands out in that period are the great tobacco warehouse fires at tobacco cooperatives in Macedonia and Thrace that Ethniki Insurance had to deal with. National Bank’s of Greece Smyrni Mansion in 1919. Ethniki Insurance was also based in the same building at the same period of time. Right before the Second World War, the company’s financial situation was robust. Its real property was considerable and its revenue satisfactory. It boasted a strong ‘money instrument’ portfolio in Greek drachmas and gold and excellent reserves whilst paying satisfactory dividends to the shareholders as distribution of its profits. Life insurance that was about to commence operations before the war was forced to postpone them due to the adverse financial conditions and, as a result, it finally started operating permanently in 1942. Monetary volatility, inflation and the civil war were the cause of major problems. 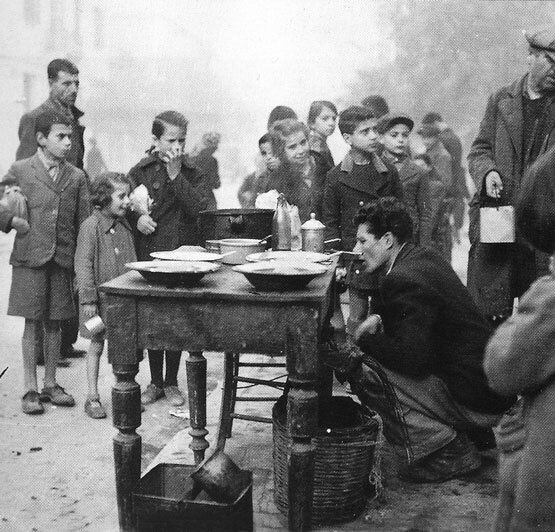 The pre-war strong portfolio of money instruments was virtually sold off in its entirety in order to pay for the costs of the soup kitchen provided to the company’s employees during the period of the German occupation. In order for the Company to address this situation, it struggled aiming primarily to the growth of insurance operations and, in parallel, to the reconstruction of its portfolio. During the German occupation, one of its main assets, the building at 4 Korai Street, was requisitioned by the Germans who forced the Company to move out of its head offices, also leaving behind exquisite furnishings. Its construction had been completed in 1938 and it was one of the most modern buildings in the Greek capital, built with the finest materials available at the time, equipped with central heating, air conditioning and elevators as well as two underground spaces that would be used by the company employees as bomb shelters in case of war. The German occupation forces established the Kommandatur offices on the higher floors whereas they used the underground shelters as detention centres for the Greek citizens. Said building, although being the apple of its eye for Ethniki Insurance, never did manage to function as its head offices in the following years since, even after the Germans left Athens, it was requisitioned again and again by the British, the National Liberation Front (EAM) and the Greek Government. However, it has never stopped belonging to Ethniki Insurance, who, after said series of requisitions, proceeded to important restoration works whereas in 1991, as part of the celebrations for the 100th anniversary since its foundation, Ethniki Insurance had conservation work done and subsequently opened the underground detention centre to the public, which is currently a unique historical monument dedicated to the period of the German occupation. In the early 50s and until 1955, the Company’s share capital amounted to GRD 9,670,000.00. In 1956, the share capital increased to GRD 27,076,000.00 and, in the following year, to GRD 28,800,000.00 remaining stable until 1970 (72,000 shares at GRD 400.00 per share). The Company’s insurance operations comprised Fire and Transport Insurance, Life Insurance, Car Insurance, Occupational Accident Insurance, Civil Liability Insurance. At that time, efforts were made to increase distribution although the overall conditions in the country were not favourable. At the same time, a new insurance sector commenced operations, Hail insurance, which, despite a good start, presented problems towards the late 50s. In the late 50s, Life insurance reported a significant turnover increase whereas the Occupational Accident insurance turnover fell as IKA (Social Insurance Fund)’s scope of responsibilities expanded in said area. In 1964, the sector of Credits and Guarantees commenced operations. For a number of years, Ethniki Insurance was the only company that provided insurance plans in this field. The last years of the 1950-1970 twenty-year period were transitional as preparations were under way for an institutional and organizational restructuring process with regard to the structure and operations of insurance companies that were active in Greece. The transitional stage ended in the following year (1970) with the enactment of Legislative Decree 400 on ‘private insurance companies”. In the thirty-year period from 1970 to 2000, Ethniki Insurance developed the largest computer centre among all insurance companies, expanded its operations in all Greek prefectures through the establishment of branches and promoted decentralization through the establishment of a large number of branches in Attica. Throughout this period, the company was the leader in terms of total insurance premiums in the Greek market. Indicatively, the premium distribution in 1994 amounted to GRD 59,384,000,000.00. In parallel, the company expanded its activities in financial products with the launch of its own mutual fund whereas, at the same time, it developed the new sector of Car Breakdown Cover. Ethniki’s Mansion at Karagiorgi Servias’ Street, in the centre of Athens. It was built during 1959-1963 and designed by architect Iason Rizos. The Board of Directors with the paintings of the CEOs is today a conference room. 1997 saw the completion of the merger with Ethniki Insurance of other NBG Group companies, namely ASTERAS, PANELLINIOS and ETEVA. This led to the creation of a single insurance company with robust capital base and adequate network, capable of serving the NBG Group as an important tool with a view to making good use of the insurance market in Greece as well as in select foreign countries. In 1998, Ethniki Insurance acquired a 30% equity stake in “EUROPE AEGA” insurance company and, the following year, absorbed “LAIKI” claims insurance company. Expanding its penetration potential in South-East Europe, in 1997, Ethniki Insurance established the subsidiary “GARANTA SA” in Romania whereas in 2001, it founded two companies in Cyprus, Ethniki Insurance Cyprus and Ethniki General Insurance Cyprus. 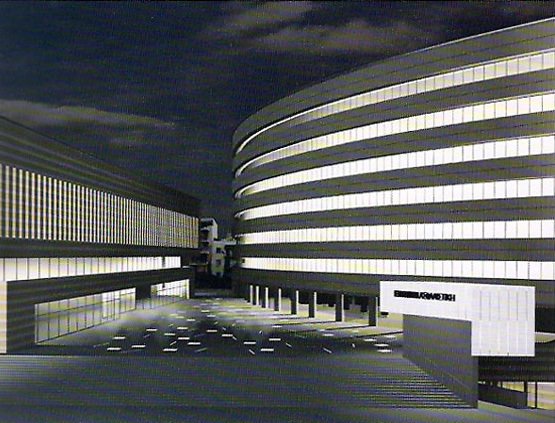 In 2005, Ethniki Insurance moved to its new head offices at 103-105 Syggrou Avenue after four years of construction works. The new building was designed by architects Mario Botta, Irini Sakellaridou and Morfo Papanikolaou in such a way as to meet all contemporary needs as well as technology’s evolutionary potential in the following years. In the course of that period, the actual activation of Bancassurance (sale of insurance services by the Bank) which started timidly in 1997 and the development of Assurbanking (sale of banking products through the insurance company’s sales network) revolutionized the field of sales and provided the foundation for harnessing the truly huge potential of a company that is a member of the largest banking group in the country, the NBG Group, that boasts a network of 555 branch offices throughout Greece. Today, Ethniki Insurance is active in all insurance sectors and the leader of the insurance industry in Greece, enjoying the largest market shares in Life insurance and General insurance. It is growing rapidly while enhancing and streamlining its infrastructure so that it can provide Greek citizens with quality services. Finally, in an effort to continue the social responsibility policy applied throughout its history, Ethniki Insurance is involved in social solidarity, cultural and sports projects, with an emphasis on environmental protection and the avoidance of climate change on Earth.